Zodiac begins with 16 year old Rhoma Grace of the House of Cancer. She is a student studying at the University on Elara, one of the moons of Cancer, to learn to read the omens and future in the stars. But Rhoma, better known as Rho, isn't like the other students who use Astrolaters to help them make sense of the future. She can do it without help, and her way has allowed her to see dark omens that the others are missing. When a violent blast destroys Thebe, another Cancer moon, the damage and death extend to the whole Cancer constellation. Cancer is not only broken, but without a leader. Because Rho's talent to See and her devotion to Cancer, she is chosen as the new Guardian, or Holy Mother, to her people. The only problem is that no one can believe what Rho has seen. Rho sees that the mythical Guardian of the fallen 13th House of Zodiac is causing the damage using Dark Matter to hide. But the 13th House is just a myth, a scary story told to children to make them behave, and none of the other Guardians can see the Dark Matter. As a young new Guardian, spouting children's tales of the boogeyman isn't getting her taken seriously. With the help of her friends Mathias of Cancer and Hysan of Libra, Rho sets out to warn the other houses of Zodiac that there is serious danger on the horizon. I have to give it to Russell for creating a super cool concept. The Astrology and the world building behind this story is refreshingly different than many of the other genres and worlds that I've read about. 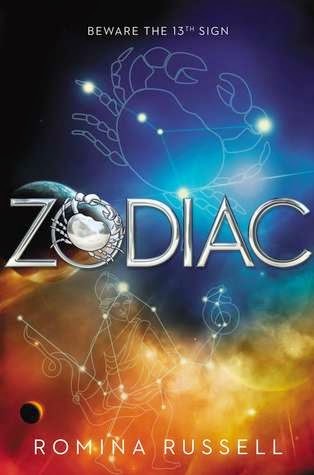 I loved reading about life in Space and learning about what each House of Zodiac is like. Very cool stuff. However, this book was super dense. Russell packed way, way too much information into 336 pages. She had to world build for several Zodiac houses, explain the way life works, and the energy that is used in the Zodiac... it was so much and it was all unfolding in small print in a small book. Because of that, the actual character and relationship building between characters got pushed to the side. Not to mention that a lot of stuff was happening and it got glossed over too and felt confusing. There would be paragraphs explaining about the new houses and the way life was there, or how this or that worked... but then when it got down to the actual plot lines that moved the story along, they were brief. When horrible things happened to our main characters, I didn't even care. In fact, I found that I didn't care about any of the characters at all. When something did happen to them, I just couldn't feel the weight of it. It was explained so briefly and then we were on to the next thing right away. OR, you'd get hit with something big and it would be resolved a few paragraphs later. I was never on edge. Russell set up a love triangle for this book and I was all set to be annoyed because I hate love triangles. I hate the stress of them. This one, however, because everything was so glossed over, didn't even feel like a love triangle at all. Or maybe it was because I didn't care? In the end, the whole thing fell flat for me. It turned into a chore to read and I had to slog through it so I could move on to the next book. I am still looking forward to the next book. What I am hoping is that Russell used the first book to get all the world building details out of the way and the following books will have more character development and growth. It is a cool story and I want so many things from it. I'm hoping that I'll get those. I probably won't recommend this book to anyone, but at the same time, it isn't a total waste of reading time. I would give it 5 stars for the idea and 3 stars for the execution of it. In the book, there is a drink that Zodai use to help them center. Pretty much it sounded like a drug or alcohol. But it helped them focus and gave them energy to do the hard work of seeing into the future and reading the stars. I decided to go with a Red Bull energy drink for this one. I felt like it would accomplish the same thing. Besides, you might need a little energy to get through some of the dense reading bits of this story.